Me and Mine: I think I've lost my mojo-- has anyone seen it? I struggled a little with two of these layouts but I'll share them anyway. They just didn't seem to come together like usual. The first one is of Gabe and my mom. It's a sweet picture and I am really loving the Cloud 9 papers right now. 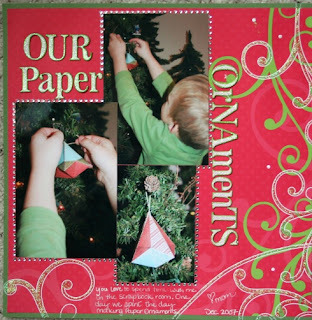 This next layout was some Christmas pictures that I took of Gabe one day when we were making paper ornaments in the scrap room. I actually outlined the letters with a green permanent marker (to match the green in the paper) and then covered the letters with stickles. It produced a nice look but I'm just not crazy about the layout as a whole. 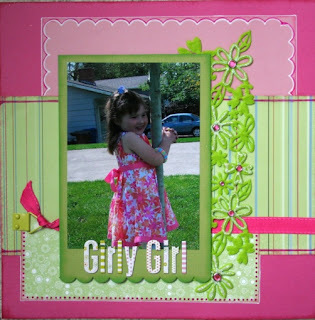 Finally, the last layout is one that I did for a layout tag game at Scrapbook Dreamer. It's kind of plain for the types of layouts that I usually do but I really like how it turned out. The picture is of Rachel, my cousins little girl.